Norfolk AUS-Port ONLY NV-AP Series. The Artificial Urethral Sphincter Port, an indwelling system, offers on-demand, long-term relief of urethral sphincter mechanism incontinence in veterinary patients. The device employs a silicone cuff that is placed around the proximal urethra and filled with variable amounts of saline to provide mechanical obstruction to urine flow through the urethra. The degree of resistance to flow is adjusted using a subcutaneous access port. The exit site is implanted, reducing the opportunity for infection. Clinical indications of the use of the AUS-Port system include; congenital and acquired incontinence that is unresponsive to traditional surgical and medical management. Notable features of the system includes the ability to percutaneously adjust the degree of resistance/mechanical obstruction to the flow of urine at any time after implantation. This is achieved by inserting a Huber point needle through the skin and into the port septum and infusing fluid until continence is restored. 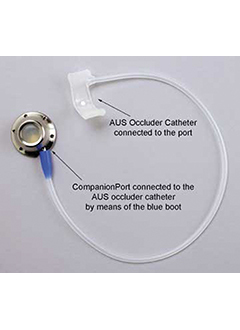 Packed as a kit, the AUS-Port System is available in three port sizes and multiple occluder widths and lumen diameter to suit all sizes of patients. Kits ship sterile and include the access port, artificial urethral sphincter occluder, 2 x Huber needles, a Huber right angle infusion set, a luer attachment, and surgical and accessing suggestions. To correctly choose the most appropriate AUS occluder size, the diameter of the urethra should be measured by ultrasound or by measuring the circumference of the urethra with a piece of suture if ultrasound is not available. The AUS occluder should fit slightly loose at first; for example if the urethra has an outer diameter of 7mm you would select an occluder with an 8mm lumen diameter. AUS Port ONLY - Small, Medium or Large.